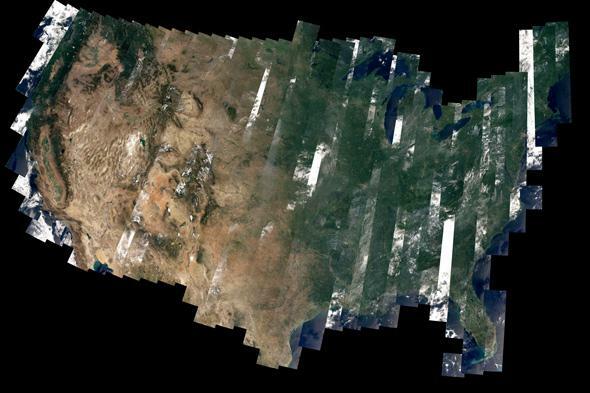 Landsat 8: First anniversary photo of America. A slice of Americana. Click to hugely epluribusunumate. To celebrate the Earth-observing Landsat 8’s first year in orbit, David Roy, co-leader of the satellite’s science team, created what is one of the weirdest portraits of the United States I’ve seen. Landsat 8 is in a polar orbit around the Earth, looking down. The Operational Land Imager, the camera that was used for this picture, can see an area about 185 kilometers (115 miles) wide at a time. As the Earth rotates under the spacecraft, it images a swath of land, a long strip running more or less north to south. Due to the cadence between the orbit of the satellite and the Earth’s spin, it takes about 16 days for the same part of the planet to get imaged again. Roy went through the data for August 2013 to look for shots that were as free of clouds as possible; obviously it wasn’t entirely possible. I’ll note that OLI doesn’t really take pictures like your camera does. It has a single row of pixels, and these take a one-dimensional shot of the ground below over and again, which can then be stacked to create a two-dimensional picture. I describe the technique in more detail in an earlier post about a similar satellite. The hi-res version of that picture is a massive 16,500 x 11,000 pixels in size, and when I clicked to embiggen it, I quickly got lost navigating it. The U.S. is surprisingly big, even when reduced to the size of a few monitors. I’m glad people are investigating the planet in such detail. The Landsat series of satellites is a venerable one, the first one was launched in 1972! They have provided continuous coverage of our fair planet, helping us understand how it’s changed over the past four decades. This has contributed to our knowledge of climate change, ecosystems, water, vegetation, and of course how we humans have affected the earth. This is precious information which will be used for decades to come. Congratulations to the Landsat team on your first year, and may you have smooth sailing for the future.